Open Jam 2018's theme was: SPAM TO WIN! 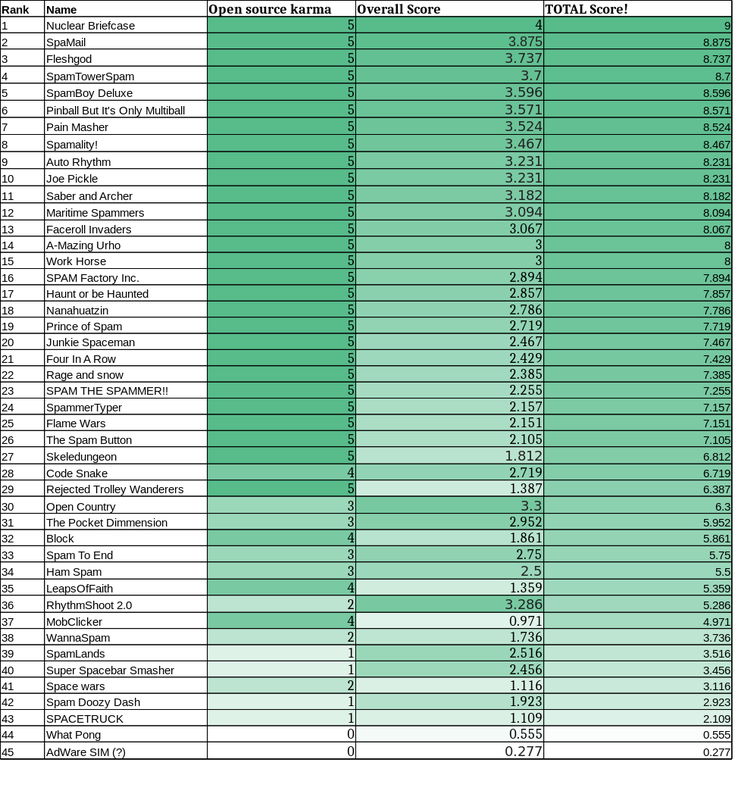 Here are the official results, with Open Source Karma points applied! (they closely resemble itch's results ranking, with a few exceptions). Open Jam is a game jam with 🖤. 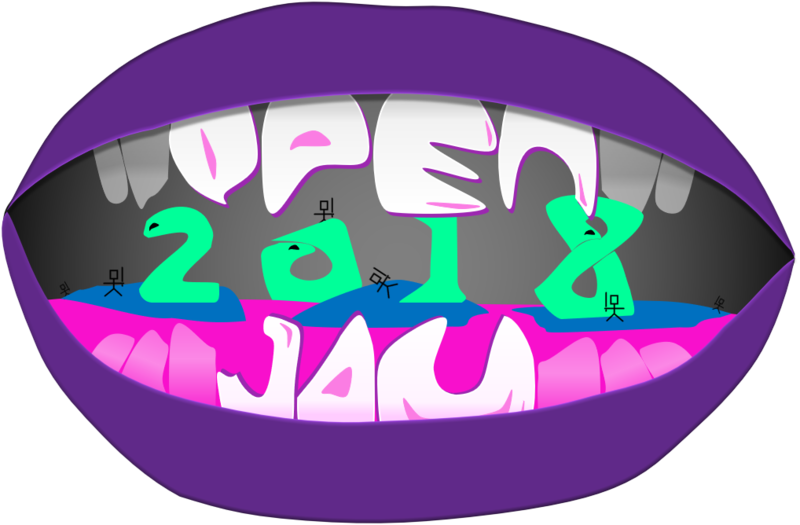 At Open Jam, you build an open-source video game over the weekend, rate other creators’ games, and compete for a chance to have your game featured at All Things Open, a premier open source conference. We wanted to host a jam that promotes open source games and game creation tools. That's why we're teaming up with Opensource.com to bring you Open Jam, a game jam dedicated to doing just that. What we want to do with Open Jam is promote not only open source games, but open source game creation tools as well. This jam encourages use of open source game engines, authoring tools, and platforms, and Creative Common assets, and to link those tools in your submission. Anything open source in your game creation process is encouraged! That is why we are hosted by opensource.com and winners games will be featured All Things Open conference. Open Jam is all about open games and open game development. You can use any tools to create your game and it can run on any platform, open source tools and platforms are encouraged. There is a new voting category for "Open Source Karma" based on open source friendly your game is i.e. how many open tools you used, if your game runs on an open platform, and a nice github repo. See table below. Games source should be available and licensed as open source. You can work solo or on a team. The theme will be announced at 1:00 PM October 5th (US Eastern). Judging will run October 8-15th and will be peer-based. Games must be original for Open Jam, they can't be entries submitted to other game jams or forks of other games. If you want to suggest an open source tool used in game creation email questions@openjam.io and I'll do my best to get it added to the list above. After judging has completed, the top three games combined score of Overall + Open Source Karma categories will be chosen and featured at All Things Open in Raleigh, N.C. October 21-23. Your game, your source code, and your contribution to open source are an even bigger prize. There are no monetary or physical rewards in Open Jam. Open Source Karma will be awarded as points on each game by the Jam Hosts based on the following score table. You will get a comment on your entry page with your Open Source Karma score from a Jam Host. You can get a max of 5 stars. Judges reserve the right to add additional points for notable open source friendliness even if not in this table.